Thirsty Pilgrim: Rochefort and Spice and Not Being Nice. It's not every day that you hear from the Beer Drinker of the Year. Nor that he accidentally brings to your attention an oversight on your part. The 2009 BOTY Cody Christman – who has his own BOTY e-mail address, by the way, how cool is that? – left a comment somewhere down below regarding Rochefort and coriander. This was related to an article – "Heavenly Brews of Belgium" – co-written with friend Roy Stevenson and published in the most recent issue of Zymurgy. This is an article I haven't yet seen in published form. 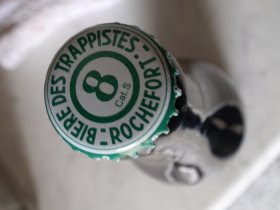 In the piece we divulge the no-so-well-kept secret that Rochefort adds a touch of coriander to its beers. Did you know that, by the way? I didn't, not for sure. Not until I read Stan Heironymous' fun and well-researched book, Brew Like a Monk. Maybe you can see where this is going. Cody asked how we knew for sure that Rochefort uses coriander. The simple version of my answer was, "Because Stan said so." In fact I thought we attributed it to him in the article. But if we had, Cody wouldn't be asking, right? Right. There's the oversight. I take full blame for not ensuring that the attribution was in there and remained there. "[Brewer Gumer] Santos downplays the use of coriander. 'It is a small amount, but people outside of Belgium think (Belgian brewers) use a lot of spices,' he said. 'Most of what they think are spices comes from the yeast.'" Sorry, Stan. Thank you, Cody. And you're welcome, in advance, to those who take my advice and buy Brew like a Monk. It's an absolute must-read for anyone inspired by Trappist ales. P.S. Anyone taking this information as license to throw a bunch of coriander into your homebrewed Rochefort clone would do better to save it for soup. Instead, I recommend whispering the word "coriander" over your brew kettle while bowing in the direction of Belgium. writing for Zymurgy now? Haven't received my copy yet. Since I read BLAM I've always wondered how "small"" the addition of coriander is. I had played in the past with coriander in the boil as well as in the mash, for flavor and as an anti-oxidant during the mash. Some peeps (like Charlie Papazian) use a tiny amount of cinnamon in the mash as an antioxidant. Anyways, I am getting off target. I would like to know exactly how much and when in the boil the coriander is added at Rochefort... if it's in the boil. I prefer the flavor from coriander in the mash, and it fits that Rochefort spice profile. "I prefer the flavor from coriander in the mash, and it fits that Rochefort spice profile." I'd say go with that... since a proper recipe is unlikely to be forthcoming from Notre-Dame de St-Remy. You could always try it both ways and see what happens. For homebrewing mags it's hard to beat both Zymurgy and Brew Your Own. I like 'em both for different reasons. Thanks for the kind words about "Brew Like a Monk." Don't sweat the attribution. What's important is that people are at least trafficking in the correct information. I am not a coriander fan myself - OK, works in a wit, but takes finesse - though not as hyper about hating it as much as like Marc Limet. And I'm not a fan of cloning. So I always suggest to people that they look for the flavors they like in a beer and let them inspire a recipe. If you love Rochefort and have always tasted a "something" you couldn't point to and maybe it is coriander then go for it. But I think you can make a great strong dark ale inspired by Rochefort without using coriander. I used to hate all the talking of throwing in tons of coriander. I think when we as homebrewers hear of something being used we jump in and drown our selves in excess. I finally actually started playing with it in small amounts and now love using coriander in some brews. 5-7grams of crushed coriander seeds in the mash can be just what the doctor ordered. I am also not a fan of cloning, but I like to know how some beers are made. Never tried cloning anything though. I rather make something that hasn't been made.